The Department of Public Service (DPS) is the staff arm of the Public Service Commission (PSC) and has the mandate of ensuring that all New Yorkers have access to reliable and low cost utility services. The PSC is responsible for regulating rates and services of the State's public utilities (electric, gas, steam, telephone and water companies), overseeing the siting of major electric and gas transmission lines and facilities, and ensuring the safety of natural gas and liquid petroleum pipelines. As a result of legislation enacted in 1996, the Department's mandate was expanded to include the oversight and regulation of the cable television industry. Approximately 98 percent of the Department's staff are financed by utility and cable assessments pursuant to Section 18-a of the Public Service Law. The remaining two percent are financed by Federal grants and coin-operated customer-owned telephone fees. The Department of Public Service is included in the Transportation, Economic Development and Environmental Conservation appropriation bill. 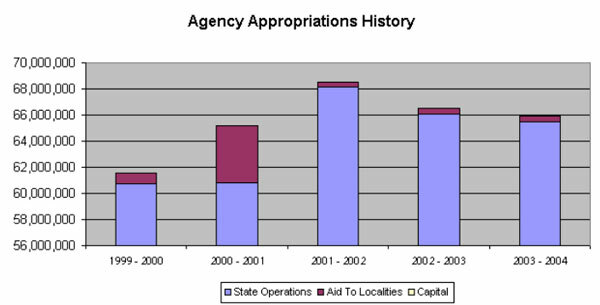 The Governor recommends All Funds State Operations appropriations of $65,912,000 for State Fiscal Year (SFY) 2003-04, reflecting a $587,000 net decrease from SFY 2002-03. The Governor proposes an overall staffing level for the Department of 557 in SFY 2003-04, representing a net decrease of 11 unfilled positions from SFY 2002-03.
the elimination of $517,000 in Special Revenue Funds-Other in the Customer Owned Currency Operated Telephones (COCOTS) Account, combined with the elimination of $70,000 in Special Revenue Funds-Other in the Underground Facilities Safety Training Account. The Executive proposes Article VII legislation to redirect these funds to the General Fund. The Governor recommends a Special Revenue Fund-Other appropriation of $400,000 in the Electric Generating Intervenor Account, reflecting no change from SFY 2002-03. Pursuant to Section 164 of Article 10 of the Public Service Law, these monies are intended to support municipal and other parties' activities related to proposed electric generation facility citings. The Governor proposes reappropriating $5,007,000 from previous fiscal years for the same purpose. The Governor proposes Article VII legislation authorizing programs to be funded through utility assessments totaling $89,177,900, an increase of $4,767,100 or 5.65 percent over SFY 2002-03 levels. Funding is provided for programs and activities in the following agencies: the Departments of Health, Economic Development, Environmental Conservation, Agriculture and Markets, the Office of Parks, Recreation and Historic Preservation, the Consumer Protection Board and the newly created Office of Public Security. The Governor also places this authorizing language directly in the respective appropriation bills. In addition, the Governor proposes legislation authorizing the Public Service Commission to direct revenues from the Customer Owned Currency Operated Telephones (COCOTS) Enforcement Fund, and redirects moneys recovered from penalties from the Underground Facilities Safety Training Account, to the General Fund. The legislation also changes the payment option for utility companies to make partial 18-a assessment payments from four times per year to two times per year, generating additional revenues to the credit of the General Fund. The Executive estimates that this legislation would provide $887,000 in General Fund relief for SFY 2003-04.